Italy and China both won via sweep, topping Cuba and Canada respectively. The USA topped Korea in four sets, while Russia topped Azerbaijan. No. 2 United States recovered from a slow start to earn a four-set victory against 10th-ranked South Korea to move to 3-0 in Pool C competition at the 2018 FIVB World Championship Tuesday. The Americans used their offense to push through, leading 61-50 in kills to more than make up for a 10-8 deficit in blocks and an 8-7 disadvantage in aces. Kelly Murphy paced a group of five USA players with double-digit point tallies, racking up 18 points with 16 kills, a serve and a block after coming in in relief in Set 1. Rachel Adams (14), Tori Dixon (10), Jordan Larson (10) and Kim Hill (10) followed. Adams piled up five blocks and added two aces. Jeongah Park was the high scorer in the match with 26 points (24 kills, 1 block, 1 ace). Yeon Koung Kim (17) and Jaeyeong Lee (11) also managed double-digit scoring efforts. Kim and Lee added two blocks and two aces apiece, while Su Ji Kim put up a team-best three stuffs. Korea built a 13-6 advantage in Set 1 as Jaeyeong’s serve gave the Americans fits. Down by seven at 16-9 midway through, Adams and Hill pulled the USA within four at 20-16. The Koreans held on for the 25-19 win. The Americans poured it on in Set 2, leading by eight at the second technical timeout, giving plenty of cushion to withstand the Korean comeback for a 25-21 victory. After boasting just a two-point edge in Set 3 (16-14), Team USA pushed the margin to five at 20-15 and converted on their first set point try at 24-21 with a Dixon putaway. Adams and Karsta Lowe turned it on down the stretch, vaulting the USA from up just two to a seven point win at 25-18. Thatdao Nuekjang, Thailand – 17 points. Neukjang kept the Thai side level throughout the match, especially when Pimpichaya Kokram exited the match with an injury in Set 3. She turned in a match-high 17 points on nine kills, four blocks and four aces. Pool B carried on its trend of sweeps with all three matches being decided 3-0. In total, all nine matches in the group have come via sweep. Italy and China sit atop the standings at 3-0, having guaranteed their spots in the next round. The teams face off in the pool finale on Thursday. 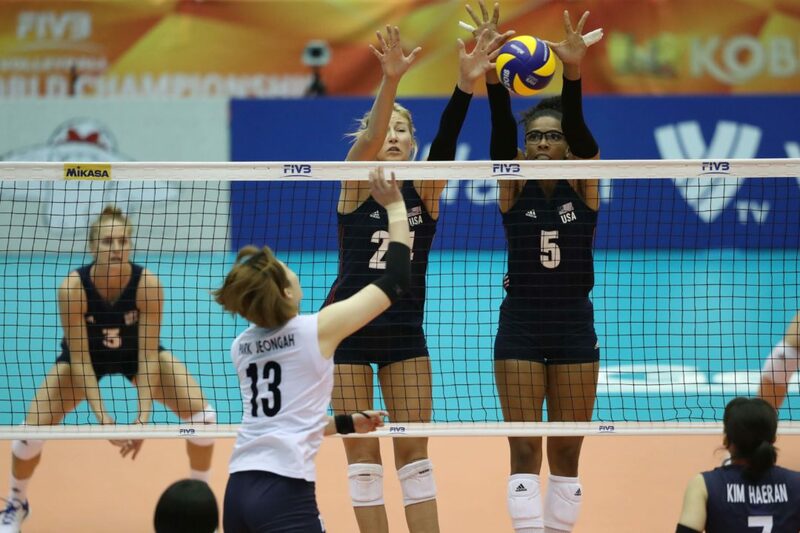 The United States suffered its first set loss of the tournament, but rebounded to top Korea in four sets and remain perfect at 3-0. Russia cruised past Azerbaijan after a day off. Thailand improved its standings with a four-set win over Trinidad and Tobago. The Americans and Russians are through to the next round at 3-0 and will play in the pool finale on Thursday for the top spot in the group.